Pick ups are between 7.00am and 8.00am. The tour departs after the last pick up. With an 8 am departure from your Melbourne accommodation, you'll depart the city, crossing over the iconic Westgate Bridge - Australia's longest, at almost 2.6 kilometres, and enjoying gorgeous views of the bay. As you pass by Geelong, you'll be fascinated to learn a little of the history and more recent attributes of Victoria's second largest city. 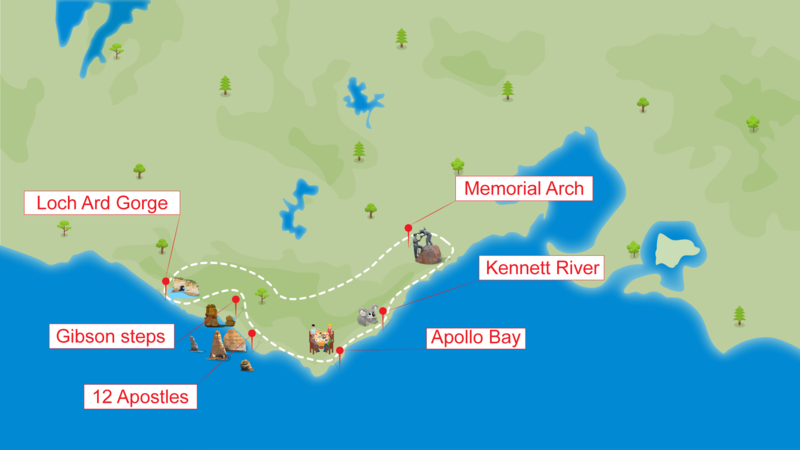 Travelling along the Great Ocean Road, your driver guide will tell you of the historical significance of this amazing hand-hewn route, created by returned World War One soldiers in commemoration of their fallen brethren. You'll stop at the Memorial Arch at Eastern View for a photo opportunity and to soak up the atmosphere. Continuing along this road, you'll see some of Australia's most beautiful scenery, which in itself is a worthy tourist attraction. Your next stop will be in the quaint township of Kennett River. Here, you'll visit some of Australia's most famous residents, the huge koala population that calls this gorgeous tract of eucalyptus forest home. The koala population here is so large, you're almost guaranteed to see numerous of these cute and cuddly marsupials! We stop to purchase lunch in Apollo Bay, followed by a stop at the attractive Cape Patten for some photos. You'll next follow the Great Ocean Road into the mountainous area and through the Otway Ranges, stopping at the popular Maits Rest for a calm walk through the ancient temperate forest, home to some of the tallest flowering trees in the world. Next stop will be Port Campbell National Park, where you'll be awestruck by the magnificence of the hugely popular rock formations, the Twelve Apostles. On to the Shipwreck Coast and you'll explore this fascinating area while learning about the doomed Loch Ard, which gives its name to the magnificent Loch Ard Gorge. You'll also see other rock formations, such as the Razorback, Dumpling Pots and the Island Archway. We also go on a tour of Gibson's Steps, where you can descend the steps to get a view of the Twelve Apostles from the beach below. Heading back to Melbourne, you'll be able to take advantage of the free WI-FI on board the coach as you admire stunning coastal scenery. Along the way, you'll stop for dinner before crossing over the Westgate Bridge and back to the brightly lit city. You'll be dropped back at your accommodation at around 9 to 9:30 pm.